This week I decided to make another new pattern. I still need to finish both of them and make them into finished pieces, as well as make the patterns, so that will come next week. This piece was done with a pattern I did in a cross stitch. I liked the elements and rearranged them to fit a punch needle piece. I really think this piece would look nicer with variegated threads, especially Valdani, but I use what I have. I decided the pup should look like Bean, so I made mine black and white. Bean has more black, but I didn't want too much on the punched pup, so I just made similar markings on a couple of areas. I still need to fix a few things and it will be antiqued a bit. One of the reasons I have a hard time punching is that a certain fur ball wants attention most of the day and night. 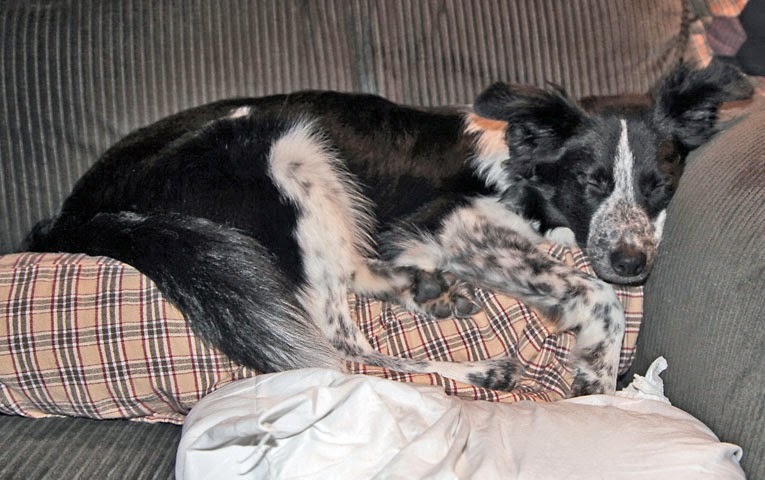 He is getting better and resting more, but I can't wait for the snow to melt so we can get out for more play and long walks. 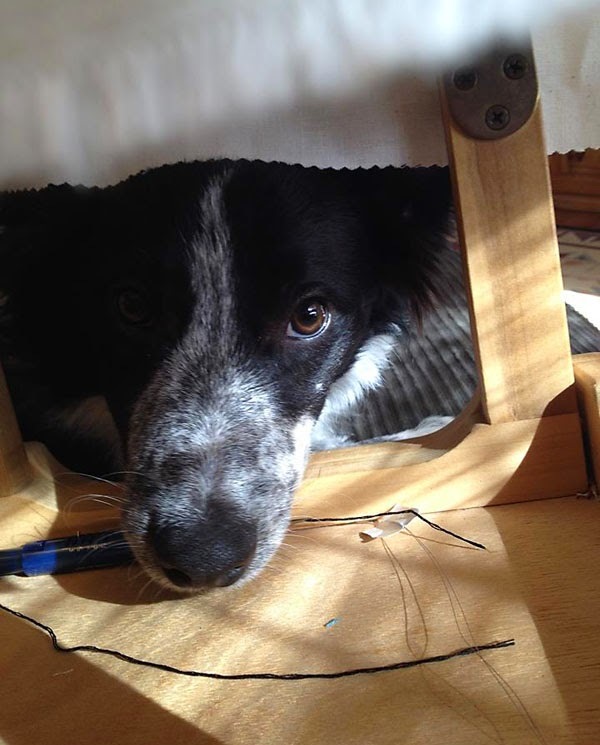 And today he was being a bit bad, so he had a time out. 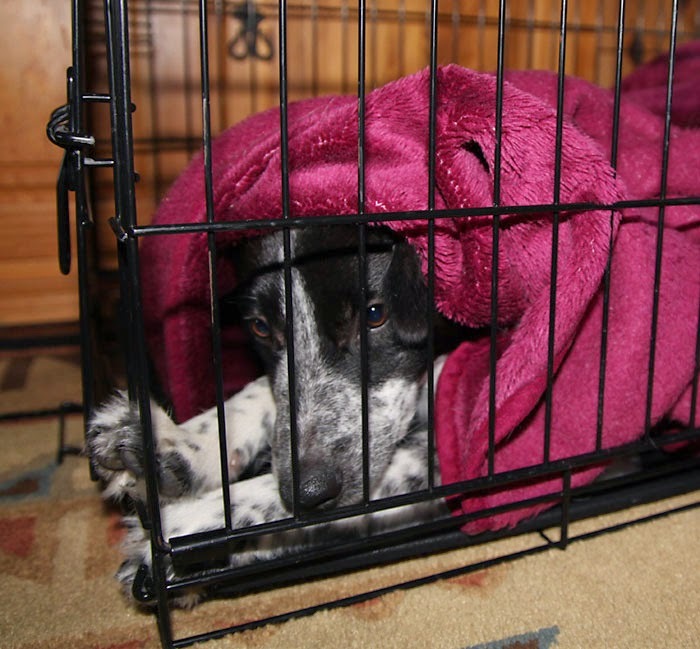 He was not happy about that and decided to cover himself up with his blanket. I hope you all have a nice weekend. I was going through my old files and found a bunny that I had made for a group booklet, that we did years ago. We each did a pattern and everyone that made a pattern, got a booklet with all of the patterns in it. 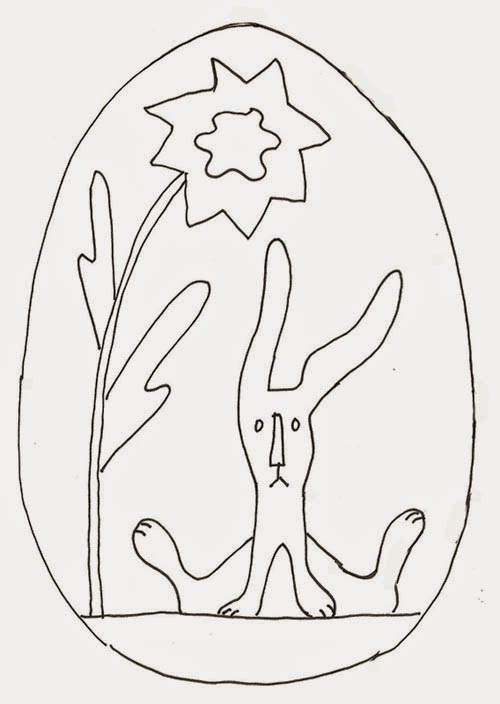 The bunny has two flowers in the original and I wanted it to fit an egg shape, so I redesigned it a bit to fit. I started it yesterday and finished it today, and I used what i had in my scrap box. I finished it off with a twisted cord of green and yellow. The background was done is varying shades of pale yellows, then I stained it with walnut, and the flash lightened it back up. The finished egg is about 6" x 4 1/2". You are welcome to use the design for your own use or sell the finished product. Please do not share or pass around in groups or make multiple items for sale at shows. I would love to see your finished pieces, mine is a bit of a mess since I rushed it and didn't think it out;) You can use it for appliqué or hooking, as well as stitchery. I redrew the design and my hand was not connecting with my brain, so it is a bit off in shape. This week has been slow, no motivation and no energy. Being stuck in the house so much, doesn't help and Bean has way too much energy to be stuck inside, as well. Yesterday Bean had to go in for his operation, so I had the day without disruption. 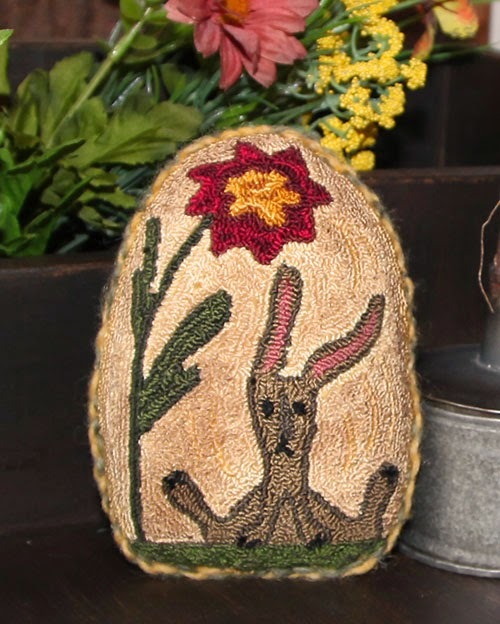 I spent the time, cutting and getting some prim stuffed Easter pieces ready to make. When Bean came home, I rested and worked on them in between his resting and need a cuddle time. The first pieces I made were little chicks. I made two to see how I liked them. The actual pattern has a gusset, but i did it the lazy way and just made two sides. 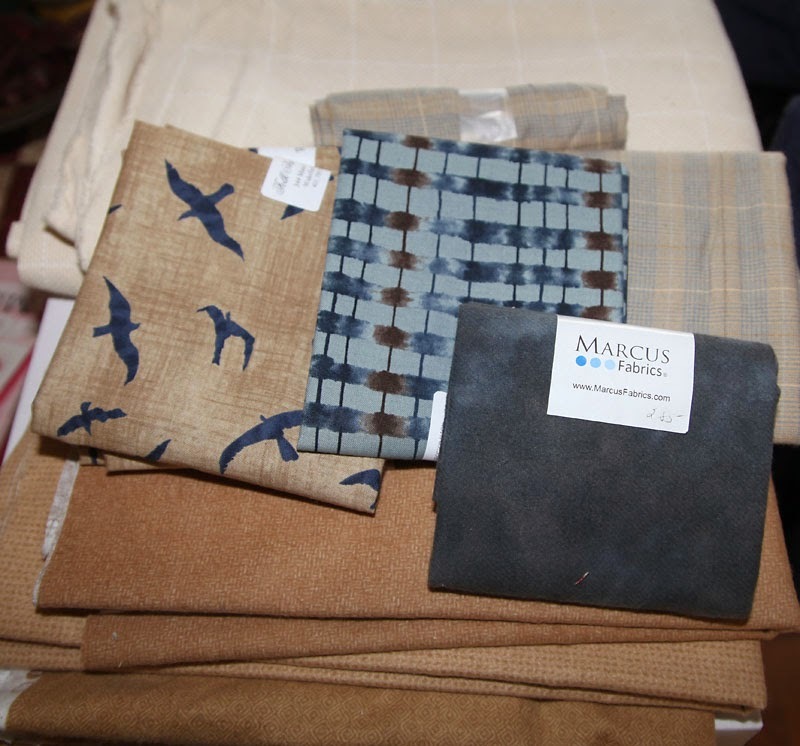 I also used camel hair wool, that I had over dyed in yellow shades. 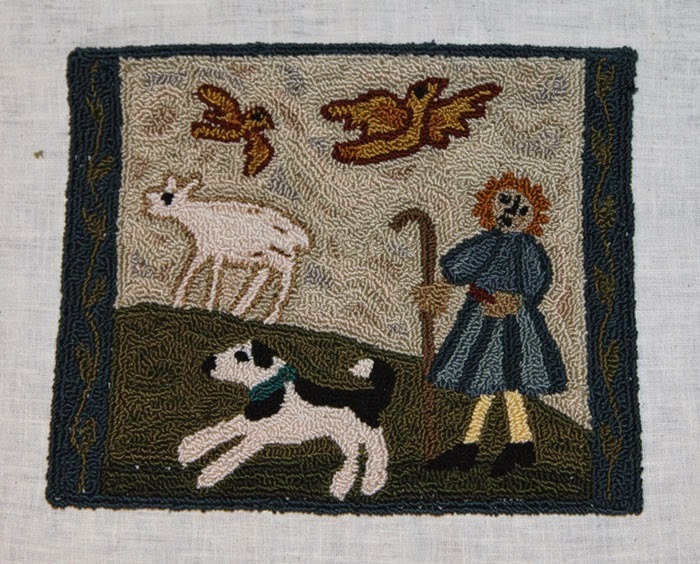 The pattern is by Pea Pickers Primitives, which is now called, Whimsical Endeavors. 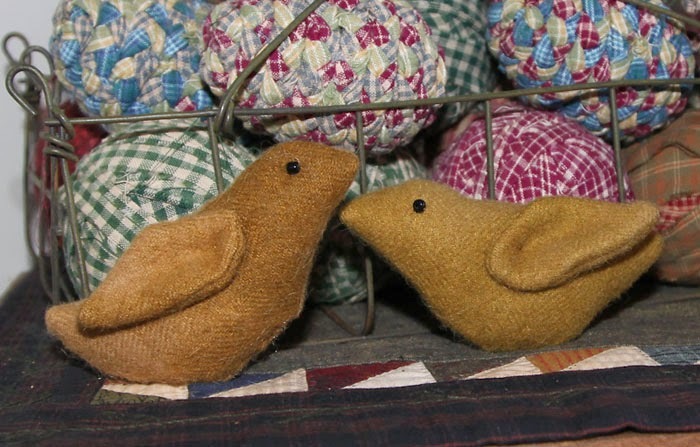 The original pattern has the chicks sitting in a rusty cup with status. I have both, so I will try that too. The second piece I did was a free pattern I found years ago. I think it was in an old issue of Creative Times Magazine. It is by Rusty Pins and Old Lace, though I think she may be retired now. You can go back through their magazines and most of the free patterns are still downloadable. I reduced the size a bit, and it was a bugger, turning it inside out. As you can see, my stitching didn't stay on track and my bunny came out a bit wonky. I used an old wool that had been over washed and it was stiff and fuzzy. I think it would be fun to make them larger, and a lot easier. The last piece is a pattern by Soft in the Head. It was given as a free pattern, at one time and I never made it. I have an old spring and the bunny sits on a spring, but my bunny is too stiff and my spring is too narrow for him, so I will make a new setting for him. I think I need to grunge it up with walnut, a bit too bright for me. 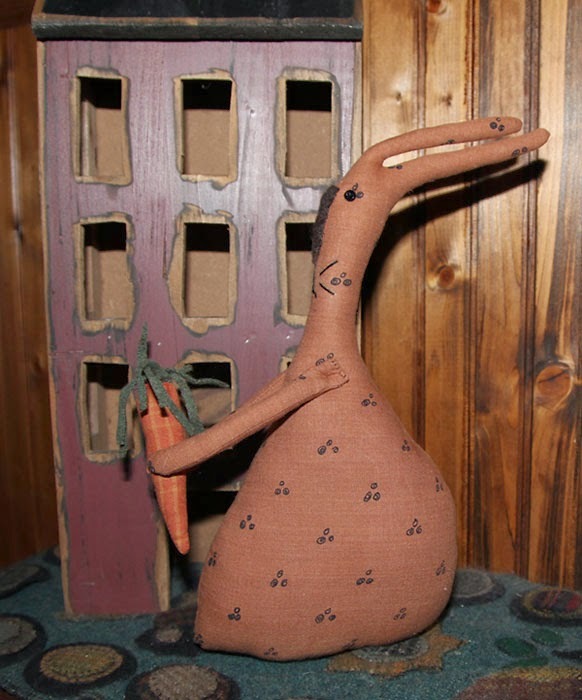 I do like the way his carrot came out, maybe I will make a bunch to sit in a bowl. Another weekend with snow and more coming in tomorrow. I don't mind the snow, but the bitter cold and winds make it impossible to stay outside for long. The good thing about being stuck in the house is, I can work on projects. I decided it was time to make a mitten pattern called Flaky Blake by The Teacher's Pet. I really had fun making it and love how it came out. I am thinking it is something that I would like to make more of, and change it up a bit and do it in different colors. This mitten is large so you can put christmas greens in it and hang it on a hook or a door knob. I think smaller ones would be fun to do on a line with mini clothespins. I added a few touches of my own, the buttons on the tongues and using buttons on the snowman instead of stitchery. The wool is very loose and stretchy so stitching snowflakes on it was impossible, I guess I need to use fusible on projects like this. My other project is month two in Buttermilk Basin's free BOM on Facebook. I had one idea and ended up using different wools, now I am debating on whether I like it. It looks better in person but the heavy pearl cotton on the leaves seems to throw it off. It is floss that I had over dyed so a light green but looks more white in the photo. 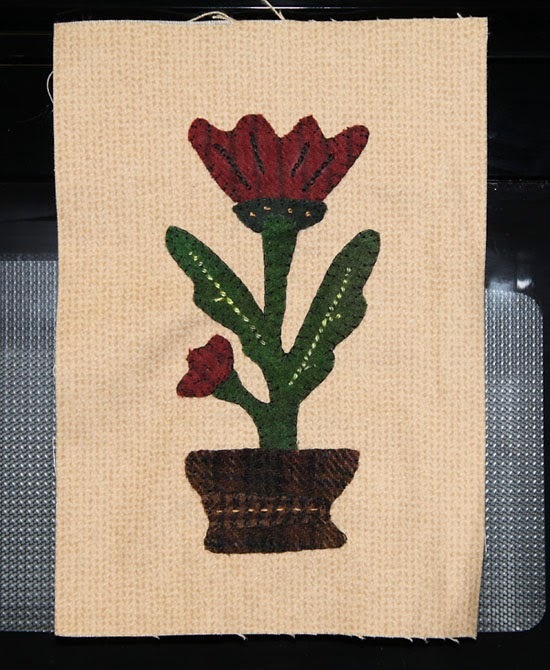 I used a chain stitch on the large flower for an added touch. So, I will relook at it tomorrow and try and take a photo outside when the snow stops. I do think I will take out the light green and find something more subtle. The background fabric is a yellowed woolie flannel. 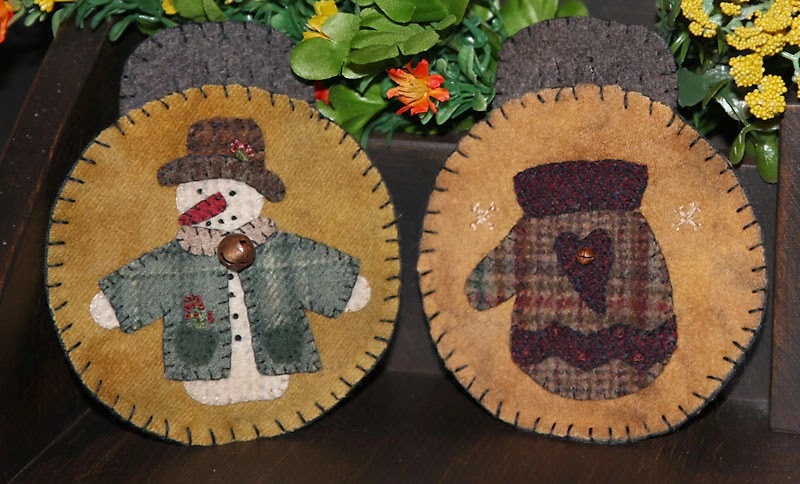 This week I finished two ornaments that are being offered as a BOM from the Wool Applique Group on Facebook, by Attic Heirlooms. It is a free pattern each month, for just that month and for personal use, so no sharing. 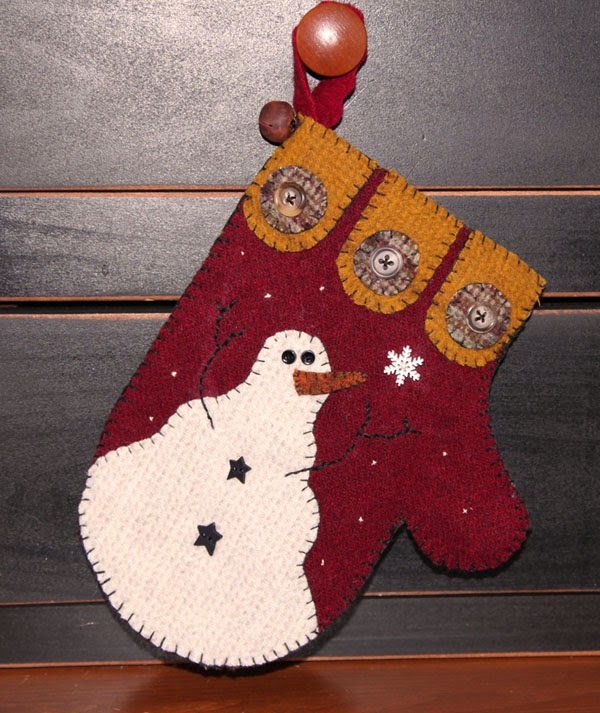 You can also download this months ornament which is the mitten, by visiting her website and clicking on BOM. Once the month is over, you cannot get it anymore. I decided to make mine larger, it is a 5" circle. I wanted it larger to make it easier to sew and I will be having them from the homespun line for next Christmas. This way they will be the perfect size to hang in front of the window and be seen from a distance. I also received a photo from Merrie of her hooked rug, that she made from my Spring Chicks pattern. I love seeing your finished pieces and Merrie did a beautiful job on her rug, that would be a fun one for the kitchen. I finished my hearts today. After I punched them, I sewed on a red wool back and lightly stuffed them. When I stitched them up, I left a little hole at the top to put the ric rack in. For the edge, I used one piece of wool yarn and gathered it, while I whip stitched it in place. The little gathers give it the little raised bumps around the edge. I decided to hang it from my homespun, in between the paper decorations. I took photos after I made them, but they seemed too bright for me. This is how they looked, as is. And this is how they look, after I used walnut stain on them. One thing nice about using the Tsukineko ink is, when you spray too much, you can pat it down to remove the excess and lighten it back up. 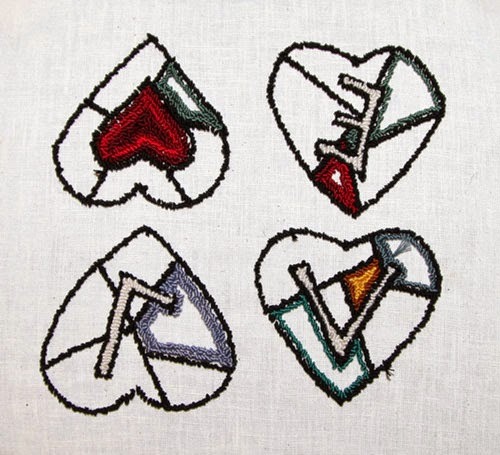 I just drew my hearts onto the weavers cloth, just remember to reverse you letters. You can also make mini ones to hang on a tree, without letters and use up your scrap floss for a hit or miss look. This week I finished my quilted piece. 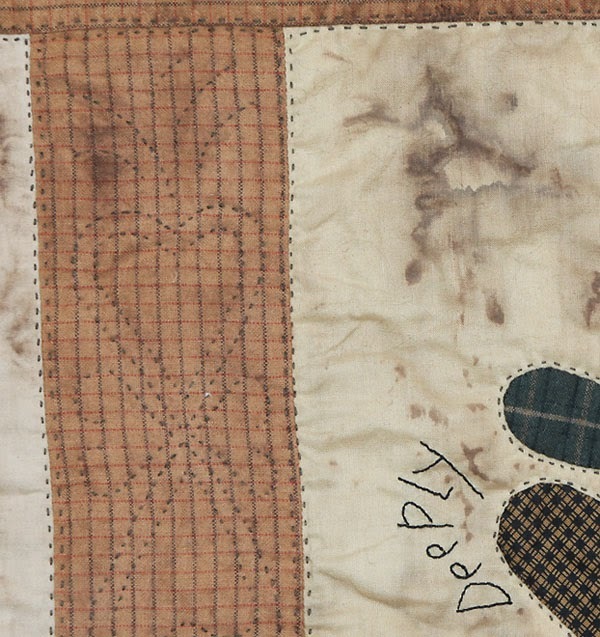 It is a pattern called Live Simply by Cheri Saffiote. I changed mine to three panels, leaving out the house block. I used walnut ink to antique it and it seems to have settled more in some places, but I like how it came out. It gives it a true stained look, totally unplanned. I hand quilted it with floss and for the middle sashings, I added my own quilt design. I drew it on with washable marker so it is not perfect, but it was fun doing my own design to match the piece. Since my daughter bought home new germs for me, I have been out of commission this week. I wanted something fun to do today, so I could sit and rest and decided to make a set of hearts to hang on my homespun garland. What I forgot about is, when you draw the design onto the backing, you need to reverse the letters, duh to me. Luckily the heart and V are fine, so I will redo the other two. I made them like a crazy quilt and then filling them in with scraps from my floss box. It is something fun and easy to do and can be done quickly. You are welcome to copy the idea to make your own. You can also keep them simple and use up your scrap floss in a hit or miss version. 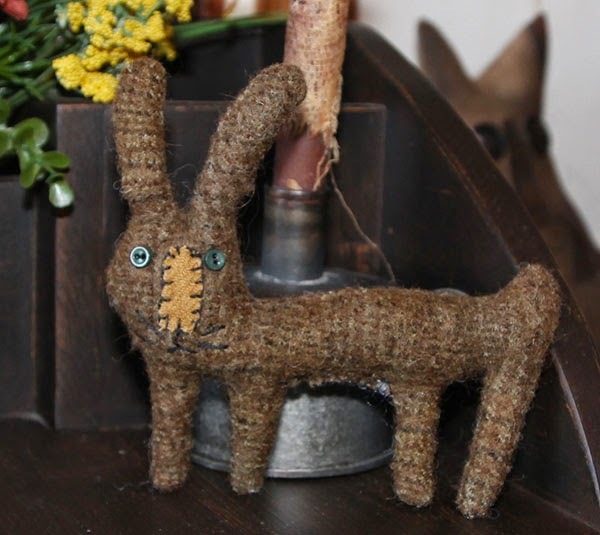 I recently joined a group called Wool Applique to share my love of wool work with others. What I didn't realize is, the group has a lot of talented crafters and generous designers. One of the things I was able to make this week was a free BOM by Stacy West of Buttermilk Basin. I love the first design and can't wait to see what other ones we will be doing. I used a flannel suede on this piece and have woolie flannels for the other blocks. I am not sure if they are all the same size or what they will be, it is a mystery BOM, so I got neutrals so I can mix and match. The only thing I changed on mine was the star, I used a button instead of wool. The bad thing is, they only had one piece of the blue suede and I messed up my cuts, so I may be able to do two more. 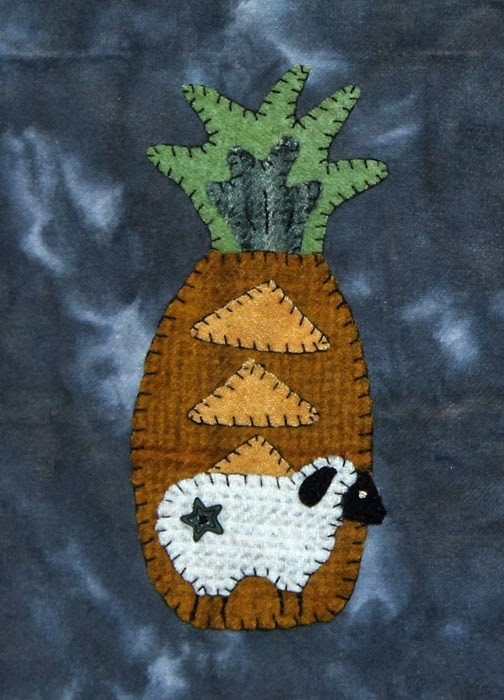 The reason I used this blue was, I made a trip to the folk art quilt store and when I saw this, I knew it was perfect for the pineapple. Since she had a supply of woolie flannels, I was able to get three neutral shades to add to the mix. I also found monks cloth on sale. It was two yards that had gotten wet, but it is dry now and nothing wrong with it, so half price was worth it. I also found some homespun to add to my stash and a fun art print for a future art piece. I have been avoiding going to a quilt store since i want to use my stash, but also fun to treat myself;) The seagull print is to go with a charm pack, I bought. This will be perfect for the border, of a quilt I have in mind. Since we had a break in the snowstorms but too cold and deep to enjoy being outside, we went to the antique barn. It is two floors of booths with antique and new items. 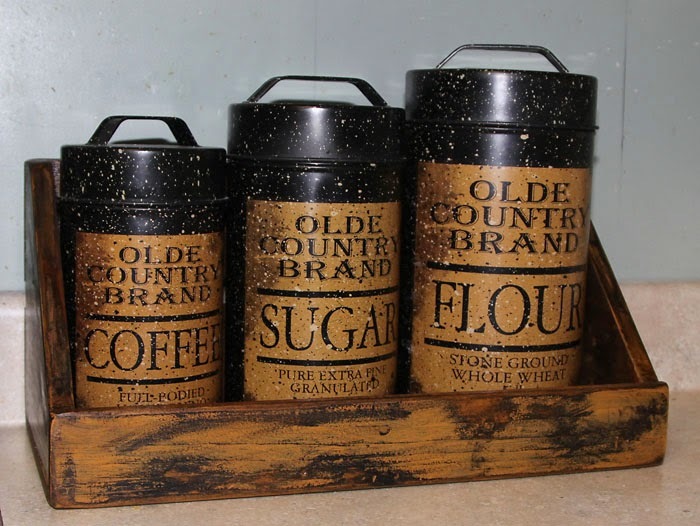 I found a wooden box that is perfect for my canisters. It was slightly used, but looks new and less than half the price, so well worth it. It is in the mustard/black shade that I am painting my noodle board. Our kitchen is a work in progress, I am still debating on how I want to do the walls.